First time ever to see one of these beautiful birds. 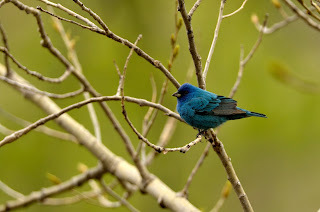 The Indigo Bunting is actually an all black bird. But the refractive nature of it's feathers make them appear blue. Only there for a short time on the feeder. Have not seen it since. Hope it comes back!